The night sky is bright with stars and the air is sweet with the smell of the sea. The procession of women makes its way across the land bridge to the temple. The sun rises to greet the Yucatan on the left and Mother Moon says her morning good-byes on the right. We each make our own private dedications as we step through the portal into the actual temple. As I close my eyes I can see the ancient Mayan women getting off their boats at what appears to be the ruins of a dock below. I am drawn to what's left of a lunar observatory or altar. One of the women in our group dances at an outcropping, chanting, her beautiful scarves blowing in the wild sea breeze. These are just a few of the wonderful images I brought home with me from a recent Women's retreat to Isla Mujeres, an island off of Cancun. This enchanted island was one of a three-stop pilgrimage made by Mayan women, and is dedicated to the Mayan Goddess, Ixchel, the Moon Goddess associated with rites of fertility, weaving, and healing. The retreat is a 7-day adventure hosted by Co-Madres Ceci McDonnell (the statuesque Mother Goddess who brings her children together to light their torches and send them forth) and Karen Rosenberg (the bi-lingual amazement who organizes details - a woman who is nourishing in the truest sense of the word!). Both are therapists from the Cleveland area. The retreat is hosted at a resort called Na Balam. A beautiful resort with food that can only be referred to as works of art. The guacamole is the stuff of legend! The staff is warm and friendly. The beaches are inviting. The gentle sounds of the surf, my lullaby each night. This was the fifth year the retreat was held at this location. The daily circles, yoga sessions, and just plain joyfulness are held at a covered palapa, which is a room built of mahogany with a thatched roof open to the exotic birds singing, the palms and the flowers. The circles were at times deep, at times playful, but skillfully designed to open our hearts to our inner-beauty and creativity. We each had the opportunity to contribute to a weaving done on a portable loom. A gift that was presented to Ceci at the closing "ceremonies,” which contained a little piece of each of us. 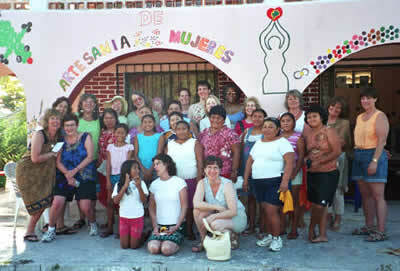 The women were brought together from all over the country, and each contributed their own amazing gifts. Beauty, talent, intellect, and humor were in no short supply with this bunch! A variety of religious backgrounds, but an abiding respect for them all. We did everything from calling the 4 quarters to lighting a candle for the Sabbath on the beach. One of the things I liked most was that this was an opportunity to really get to know the people who lived on the Island. There is a local group of women who have formed a bead collective. They make beaded medicine bags, necklaces, bracelets, and the proceeds go to support themselves and a local children's clinic. We were asked by Karen to bring a donation of beads for the coop. One of the women from our group, our Goddess of Chocolate, Kelly, put the word out at her place of employment, and had a suitcase of beads for these women! The looks of warmth and graciousness on their faces as they accepted the gifts is a memory that I will carry with me for quite a long time. Painted on the building at the coop, was a Spiral Goddess. The antiquity of the Goddess, and the fact that her face is everywhere, as evidenced by the faces of these beautiful women, truly struck me. A deep sense of gratitude is also something I came away with. There is a wonderful and very skilled seamstress on the island named Hortencia. You pick out one of the brightly colored cloths; she eyeballs it for measurement, and can make you any piece of clothing imaginable. We were all sporting our "Hortencia's" by the end of the week. She invited us all to her very warm little cubicle; picture a space at an open-air flea market, where she had her sewing machine. She gave us all a gift and thanked us; because the money we had spent having her make these treasures for us had paid her daughter's tuition at the local school for a year! We also visited a local cemetery. It was like something out of a storybook. All the gravestones above ground with small glass boxes or cement enclosures acting as altars on them. Some of them actually wired for electricity so that their light could shine perpetually. We came across a family sitting at a gravesite singing to their deceased ancestor. Na Balam also has massage available at a palapas cabana. While I myself did not get signed up in time, many took advantage of Maria Luisa's shaman like skills and use of aroma therapeutic oils. Each of you who joined me on this journey, accept my respect and admiration. I wish that I could put it into words and honor each of you for what you brought to me. But there are too many words. I suppose Namaste will have to do! Please check out the web site at www.islawomensretreat.com or email kfrlisw@aol.com for updated and more in-depth information.